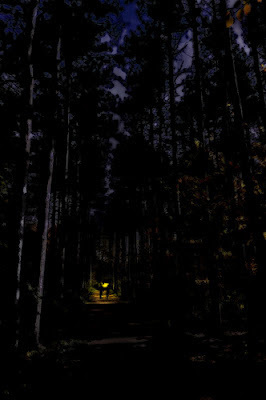 Two men appeared out of nowhere, a few yards apart in the narrow, moonlit lane. They turned without speaking and walked north, toward the small village nestled in the heart of the primeval forest. A deep layer of fallen leaves masked what little noise their paired steps would have made. The setting moon cast long shadows in the deep blue of the night when the two men passed the first cottage on the perimeter of the village. When they reached the center square and the communal well they stopped, the distance between them the same as it had been when they’d first appeared. Simultaneously, they walked in opposite directions – one west and one east – moving silently past the small shops and into the cottages occupied by the villagers. Stopping at the first homes they reached, their fists raised in unison and knocked. The village, when viewed from above, resembled a wagon wheel. The two silent strangers moved down the spokes of the wheel, knocking at doors, never speaking. The house to the west was home to a young family, with an infant only days old. The parents had been awakened by the baby a short time before, and had only just settled back into their bed. At the knock, the father sighed and pushed up from the bed to shuffle to the wooden door. Swinging the door open, he glanced up into the blank face of the man waiting there. A shiver of fear took him by surprise, making him frown. Silence met the young father’s question, and he realized that despite the bitter cold, no familiar puff of vapor betrayed the stranger’s breath. A chill that had nothing to do with the night air stiffened the father’s spine and he moved quickly to swing the door shut. “Who was it?” His wife’s sleepy voice startled him. “No one…it was…no one,” he answered, climbing back into the bed. As the sun rose over the trees and crept across the rooftops, an unnatural silence grew in the village. The strangers met at the well and turned to reenter the darkness of the forest, disappearing as the first wails of those left behind rose into the dawn air. This post is my response to a prompt from Write on Edge - using as the first line : "Two men appeared out of nowhere, a few yards apart in the narrow, moonlit lane." Please take a moment to make a comment and let me know what you think! I love the imagery, but I'm not sure I get what is happening... is someone dying at each home? Not the baby! My favorite line: "A deep layer of fallen leaves masked what little noise their paired steps would have made." By the way, after I entered my link, BEFORE I clicked on yours or any other, I googled the first line. Your blog was the first suggestion that came up, but that might be Google knowing that I visit here often! I deliberately kept things vague - I was thinking that would make it creepier because the reader will fill in whatever is most unsettling to them (as opposed to me filling in what I find unsettling, which might not bother the reader at all). I like the way that you left things vague, and your description of the night is evocative and very visual. You add an extra dimension of creepiness by the lack of a puff of breath, the possibility of something inhuman, superhuman. The use of the word 'tandem' threw me, too. I only know it as meaning 'one behind the other', so I find the idea of them moving in opposite directions but raising their hands to knock at the doors 'in tandem' a little hard to follow. Would 'simultaneous' work better or does that give the wrong idea? Thank you! I changed "tandem" to unison - I think it works better, thanks for the suggestion! Very ghost story-esque! I both love and hate leaving readers to question what's really going on - love it because it makes me wonder what's next, hate it because of what my mind conjures and not knowing the answer! The only suggestion I would look at to maybe build the supense even more would be to move this paragraph "The village, when viewed from above, resembled a wagon wheel. The two silent strangers moved down the spokes of the wheel, knocking at doors, never speaking." to just before the scene with the baby and then move this paragraph "As the sun rose over the trees and crept across the rooftops, an unnatural silence grew in the village. The strangers met at the well and turned to reenter the darkness of the forest, disappearing as the first wails of those left behind rose into the dawn air." to just before the wife asks who it was. Then the reader would really be left wondering at the father's response. I adore the suspense and horror of the piece. The wagon wheel is an especially compelling image. And I agree that it would be good to make another connection to that husband. Ack! Google ate my comment! Shorter version: Love the wagon wheel image. Love the horror and suspense. Like Wisper, I think a link back to the father at the end would be helpful. The wagon wheel village shape totally gave me the willies, because the shape of a place is only ever relevant when bad things comes of it! I think the wagon wheel was a great image, but the way it was introduced seemed a bit "out of scene" to me, almost like the fourth wall is broken. I'm having trouble explaining it and I don't know how I'd "fix" it. It certainly isn't a deal-breaker though, and I absolutely love the scene. I'm just happy I didn't read this at night. I could be having nightmares! I think making the change that Wisper made might fix that, I'm going to do a little experimenting. I was going for a sort of camera drawing back effect, to see the movement of the men through the village. I was also having trouble with tenses, which is unusual for me! I agree that it would be cool for you to keep going. It's a great beginning...especially for a screenplay. Thanks! I've toyed with script writing, but it's the one area of writing I have absolutely no experience with, so it's a little intimidating! I LOVED it, and will go as far to say so far it is my favorite one I have read. I love the not knowing, the suspense and the creep factor. You can do soooooo much with this. My version in my own little head is a Sci Fi spin on it, the guys leave something behind after they knock on the doors. Well done! Thank you! I tend toward Sci Fi myself - not necessarily aliens, but travelers or advanced civilizations maybe. i agree! very creepy and interesting. good job. Thank you! I'm so glad the creepy came through! That creeped me out! Great job. Mmmm... setting! A chill down my spine. Lovely way to establish a scene, but more than that: a mood. Well done!